WARNING!!! Do not make these cookies. Don’t even dare to put one in your mouth, or your diet is over at the very moment. I meant to eat only one, you know. 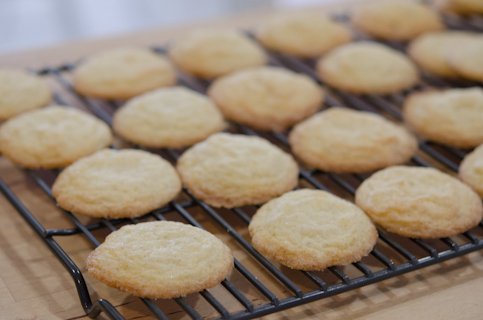 But if you really want to taste the simple gourmet flavor of true vanilla sugar cookies, make a batch by all means. I don’t even like sugar cookies but these are truly good; crisp on the edge yet soft in the center with speckles of vanilla beans. Irresistible is the exact description of how good these are once you put one cookie in your mouth. 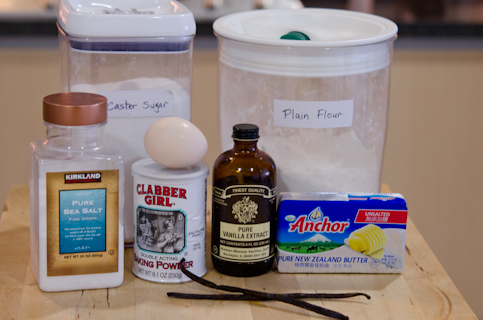 Quite simple to make with ingredients you already have, only add vanilla beans. 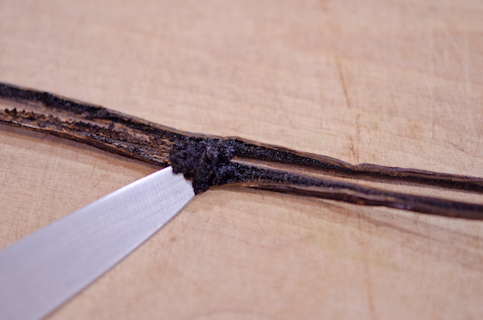 Split vanilla bean half lengthwise and scrape the goodness of mother nature. 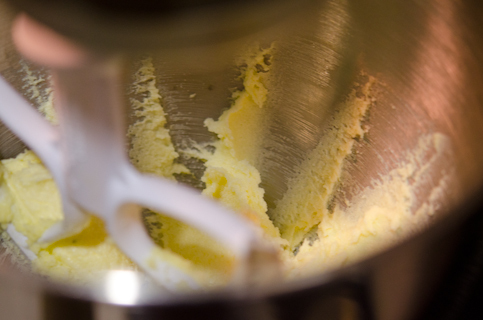 Add the seeds to the butter mixture. 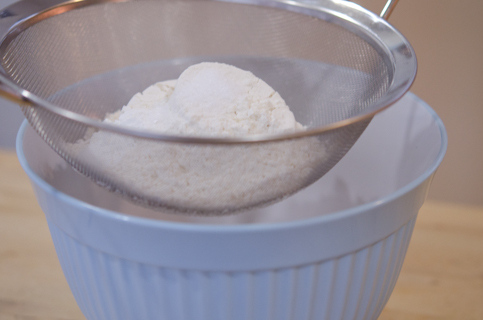 In a separate bowl sift flour, baking powder, and salt. Add to the mixture and beat until just combined. 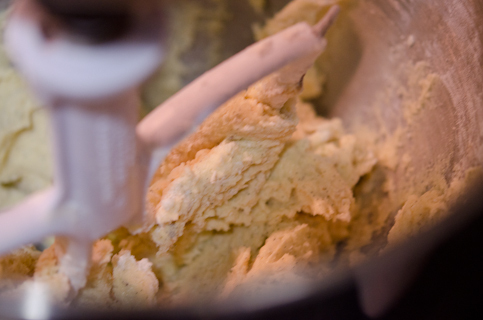 Now, you need to chill the dough for at least 30 minutes. 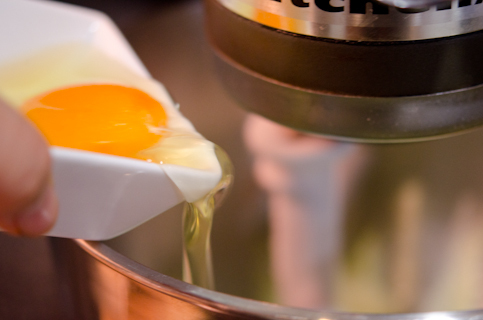 Make them into a teaspoonful ball and roll in the sugar. 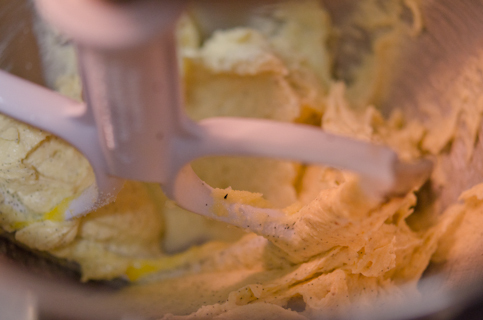 A small cookie scoop is great for this job. 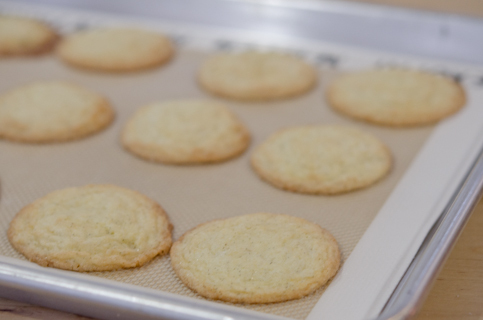 Place them 2″ apart on the cookie sheet lined with baking mat or parchment paper. 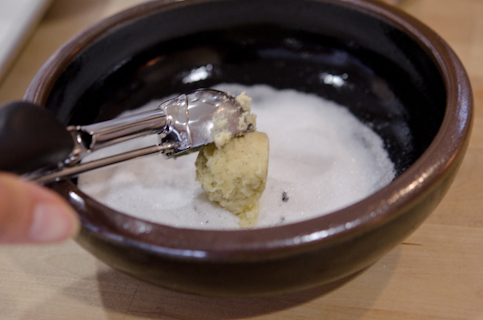 Bake for 6-8 minutes at 350ºF (170ºC). The edges will be lightly golden and the centers are soft. 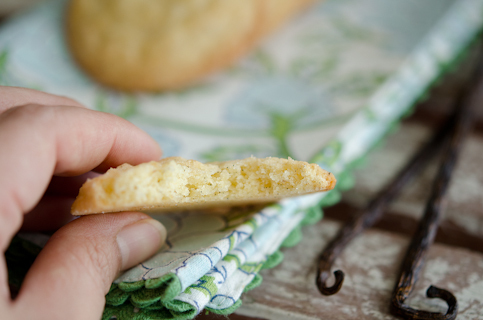 Be firm to one of your hands who is reaching out to these cookies. I literally had to slap my left hand with my right hand because she kept putting these into my mouth. BTW do not throw away the vanilla bean shells. Keep them with sugar. 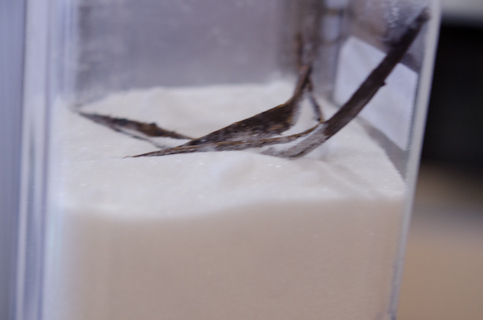 You will have fragrant vanilla sugar for your next baking project. Just remembered the song that describes my feeling toward these cookies. Can’t even remember the name but this is how it goes. Hope your days are as sweet as mine. 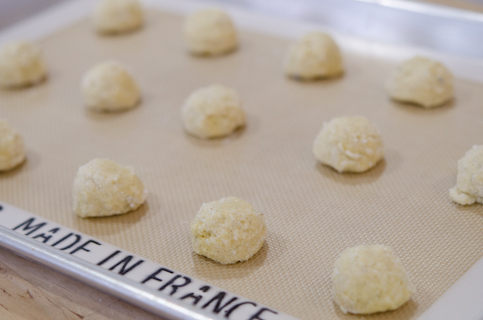 Make into 1 inch size balls and roll them in 1/4 cup sugar. 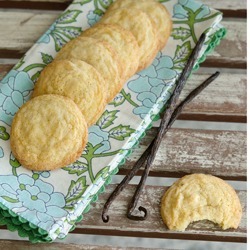 Place them 2" apart in a cookie sheet lined with baking mat or parchment paper. Oh, these look amazing! I'd love to have a bite of one :D The diet is dead to me! I really think there's something to be said about using real natural products in a recipe and it really shows in quality and from what I can tell, taste! I'm new to the blog-o-sphere and love what you have! ﻿please take a peek at a newbie's attempt ( Nurseyourcravings.blogspot.com) and i'd love a pointer or two! I cant wait to bake these irresistable cookies. I am sure it will be gone in seconds knowing my hubby and son loves cookies. This looks delicious. I'll make these with my nephews. Yes, they will be. My family of 4 literally ate the entire 3 dozens in one day. Thanks Tanya. Hope you like them. Thanks for your visit. I will take a peak on your blog soon. Ha ha! Mine was over at the very moment when I bite onto the first cookie. Thanks Joanne. 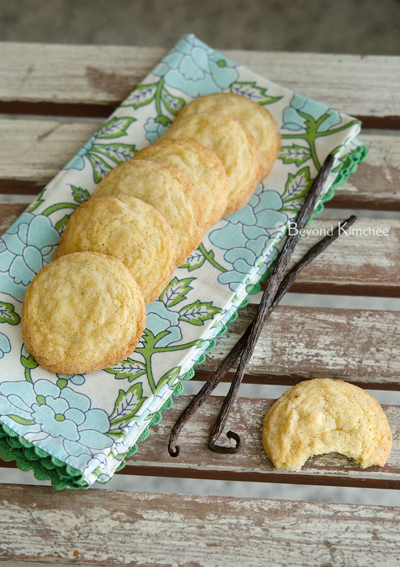 You will love these cookies if you like vanilla. sounds just gorgeous! i love the smell of fresh vanilla! 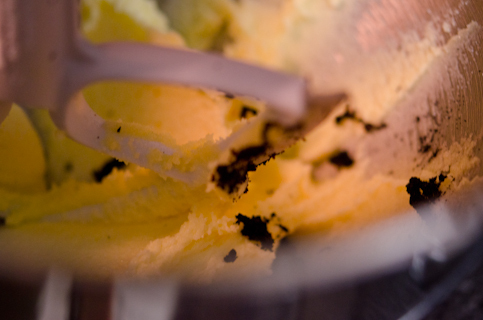 as a kid icecream mainly came in 3 flavours-chocolate, strawberry and vanilla- i used to think that vanilla was the most "boring" flavour, but now that I've grown up, I adore that sweet scent of vanilla. almost makes any baked good better! You ate 7 and you "don't even like sugar cookies"?!! These must be terrific cookies! I'm not wild about sugar cookies myself, so I'll have to give these a try. Nice post - thanks. Thanks Kitchenriff. I paid the price for eating 7 cookies that day. But these cookies are really good. Depends on what is on the plate. Made my first batch!! Definitely a recipe for keeps. Is this also known as saboro in Korean? That's the first thing my partner said when biting into his first piece! 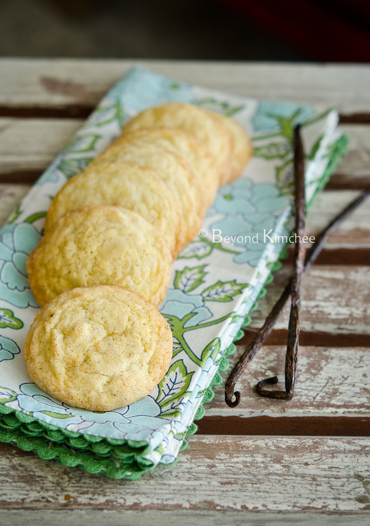 Pretty much same with saboro cookies since they are butter vanilla cookies.